Turn our stock packaging into your custom look. High quality at value pricing. How to use this chart: For each product you are ordering, please follow these simple steps. Find box order quantity required. Quantities are identified at the top of each column. Locate the appropriate run charge where the number of colors and designated quantity intersect. A run charge per box is listed under each quantity desired. 2 copies: Multiply the rate determined in Step 2 by 2. 3 copies: Multiply the rate determined in Step 2 by 3. Continue this multiplication process for additional copies. More than two copies subject to quote. What is my price for 5000 Red one piece 1 lb. boxes hot stamped in one color, gold foil, one copy (logo, ingredients, net weight)? Impress Packaging will mail a photocopy or fax a proof of artwork and layout for your approvaal. We must have a signed proof before proceeding with plates and scheduling production, so a prompt approval will expedite your order. There is no charge for these proofs. For an imprinting or foil stamping press proof, a charge of $75.00 per color will be added to any art and plate charges. Remember, a simple design will give the best results. Be sure to print the copy exactly as you want it to appear on the box, using the blank side of the Order Form. Impress Packaging will prepare your artwork for a nominal charge, for the best results. Please mail original artwork, if you have it, to Impress Packaging, attn: Graphic Services - we will evaluate it before you order. Pack it with care; artwork must not be folded, stapled or bent. Photocopies or faxed artwork are not acceptable for reproduction. We require CLEAN black and white art, or computer created digital art. Illustrations in your artwork must consist of clean black line drawings-we cannot use shading, halftone screens/tints, pencil sketches, art on colored backgrounds or foil labels for reproduction. Broken letters or lines will give poor results. 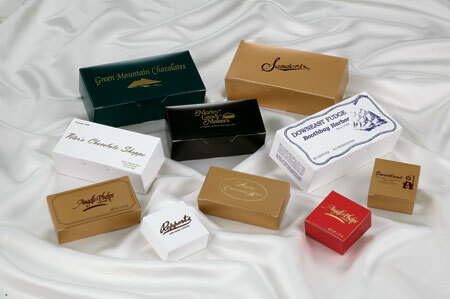 Impress Packaging can imprint or foil stamp your logo, ingredients, etc. in Full Case quantities, and usually can ship within 10 business days after credit and proof are approved. Exact repeat orders can usually be shipped within 7 business days of credit approval. Do you want exact quantities? Use the handy chart above to calculate costs of imprinting, foil stamping or embossing your order. Quantity pricing does not offer assortability, you must use the same copy on all boxes, and they must all be the same product number. For your convenience, if you have plates standing at another packaging company, Impress Packaging will remake your plates at no charge. Contact your sales representative for details. This is the charge for producing new or revised art, and the plates that apply your image to the boxes.We will give you a cost estimate before starting the process. We keep your imprint/stamping plates on file for four (4) years after the last use. After that time, you will be charged for new plates. Changing an imprint into a foil stamp involves a different process, and you will be charged for a new plate from your imprint art on file.You will be invoiced for art and plate charges when your order ships, or within 60 days of order entry, if that happens sooner. Impress Packaging artwork on imprint orders that are cancelled will be billed. Customer furnished artwork: we are not responsible for errors, and customer has sole responsibility for trademark/copyright compliance in using logos, symbols or marks in imprinting artwork. Impress Packaging stocks, at no additional charge, all popular PMS colors (Pantone Matching System).